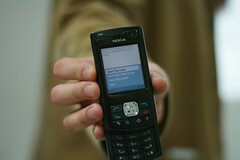 Sydewynder is an open-source SMS receiver and sender application written in Python for the Nokia S60 phones. It can automate the responses of messages and can be used as a mobile application server in areas where setting up a traditional server may be difficult or illegal. It also is very useful for prototyping mobile applications, such as games, without the burden of expensive hosting. As such, it works very well in educational settings. It even includes an emulator for developing scripts off of the phones. Sydewynder requires the latest version of Python for the S60 (>= 1.4.0). If you are using earlier version of PyS60, please update your phone with the latest software. To install Sydewynder, copy the contents inside the "sydewynder-x.x" directory into the E:\Python\ directory on your S60 phone (this should be the memory card). Sydewynder comes with "Pig Latin", "Ask Tom Cruise", and "We Feel Fine" as example scripts, as well as arcade.py, which will run all of them from a single server instance. Feel free to look at how the files are constructed and modify them for your own purposes. Pay special attention to the comments, as they will make developing new apps for Sydewynder much easier. Scripts developed off-phone can be run like any other Python script if the syde_emu.py module is in the same directory. When you run your script from the command line, a crude emulator will appear and guide you through a typical interaction between cell phone users and the Sydewynder app you have created. This project was featured on the front page of the CDT department website. It was also part of Paul Notzold's Ask Tom piece, which was on display at the Chelsea Art Museum for the Parsons 10 Years Running show. Participants were asked to text a question to a number and received back a random (or is it?!) quote from a famous celebrity whose name rhymes with Bomb Booze. The phone "server" running Sydewynder stayed up for about two weeks straight without much of a problem. If you're using Sydewynder, be sure to drop a comment on the Sourceforge forum and let us know what you've done with it. And be sure to post there if you need help or run into any bugs. Sydewynder is copyright 2007 Mike Edwards and is licensed to you under the GPL version 2.0. "Ask Tom" was developed with Paul Notzold. "We Feel Fine" uses the amazing wefeelfine.org API to work its magic. A new cell phone? Ho-hum. A new cell phone running on free software? It's been done, but you've got my attention. A new cell phone running on free software, using completely open hardware? And they'll give you the tools to bust it open and make it easy to solder stuff onto its I2C port? RAWK! Kinda makes you wonder... what would YOU hook up to a cell phone, if you could? Gets me wondering about some of the tech I saw in Malawi, particularly in the health sector. Stunt Phone! Just a quick gallery I put together to show some of the possibilities for what a fearless phone can do. Since the mobile-hone cameras are so small, tough, and wireless, they can take stills and movies from interesting and dangerous places. Kind of like Jackass for cell-phone dorks.